Since two weeks ago, I’ve started to use my T-Mobile 3G data stick again, which I use when I’m at my grandparents (no landline internet connection). Before then, it’s worked pretty much without any major problems. Very reliable, speeds were constantly fine, nothing to moan about. Since I’ve started using it again, it has been very noticeably different. 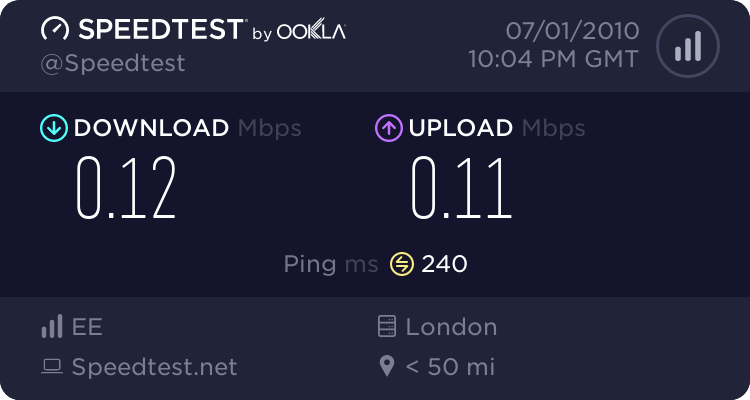 To start, the speeds i’m getting is appalling. This was two weeks ago. It got better the next day, but not by much. Two weeks later… a lot worse. Today it’s at the point where web pages will not load, time out, and I can do nothing online. No web, no IRC, no nothing. Can’t do a speedtest because that page won’t load. Can’t play Worms Armageddon online, a game that originated on dial-up connections, because I will just time out. It is that bad! Now, I’ve phoned up T-Mobile customer support several times, with varying responses. Third time (two days ago), they say they well call me back. Fifth time (yesterday), I phone them up since speeds had plummeted to 0.02MB/s and pages were taking on average 30 seconds per page to load! They check the transmitter and it is red flagged and engineers are looking at the problem. They specified no time scale on when the works are complete (so this could be two days, or two months). I’m now thinking of either phoning them up again, or going to TESCO to buy a new 3G card with a different provider. May not be as flexible as the t-mobile plan, but if it’s a damn-sight more reliable, then I don’t care. They finally told me the reason why I’m experiencing sluggish speeds and reliability problems. They’re decommissioning the local transmitter. A transmitter that works perfectly and they’re taking it down and instead i’m being served by a transmitter that’s being overloaded, looking at OfCom records is older and currently broken. WHAT?! I haven’t used my stick in a while but that’s a sad looking speedtest. Even I never got that low. Good luck getting it fixed. I got my stick unlocked by a friend, so you can likely do it to yours as well. Give 3 a try, they seem to be pretty fast at loading pages in comparison to T-Mobile, and they use Orange’s network. That’s what tesco stock in-store, so that’s probably going to be it.